Testing at Fiorano last week. The competition... probably not happy about this. Power with ACO mandated restrictors is around 470hp. That's 100 less than the 458 Italia street car and 30 less than the 4 liter engined F430 GT2. 18" wheels (vs 19 on the Challenge). Weight is, again ACO mandated minimum, 1245 kg / 2745 lbs, up 27 kg / 60 lbs from the 430. The NACA duct on the rear fender, gold BBSes, and bonnet ducts remind me of an '80s Ferrari race car, like an F40 Evoluzione or something. Gorgeous. By far, much prettier than a 430 GT2. Looks a little retro. Reminds me of the NART 246 Dino Lemans 1972 in the nose area. Looks like an MR2 based kit to me! Probably the first time since the F1 that the race cars have got progressively more ugly than the road cars. I could not agree less with the above comment. I'll be honest, the front looks hideous to me. I don't know why - but I just don't dig it. That said, this is going to be one fast MF on track in 2011. Holy crap that's an ugly front end. Loving the machine-gun ports on the front for 'wasting' the competition !!! Oh whatever, they'll all catch fire/explode and the little German car with the engine in the wrong place will trundle past. The front looks a bit dodgy because theyve put tape over the radiator duct which breaks up the lines a bit imo. A racing car has to be efficient, and from that point of view that hideous front makes a lot of sense. On the F430 GT2 the radiators were mounted in the left and right corners of the front fender, being very exposed to the impacts that often happen in GT racing. 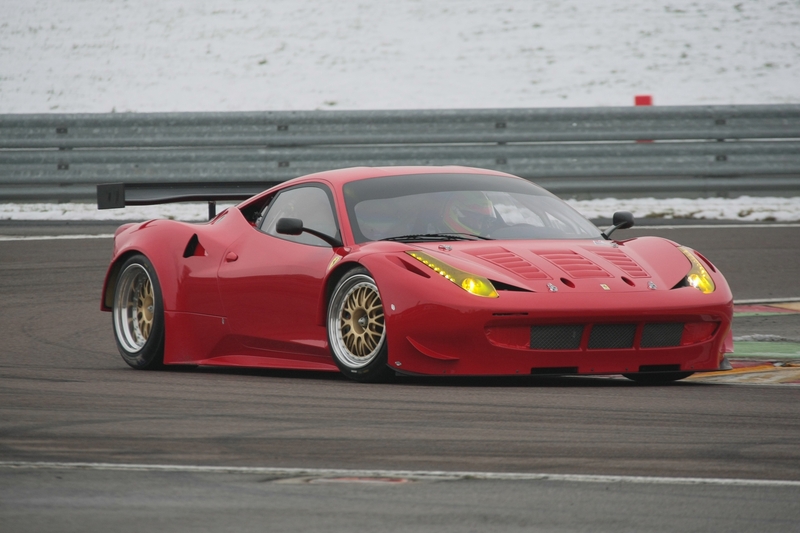 Kessel Racing were the first ones to put the radiators under the front bonnet when they homologated their GT3 version, and Michelotto liked that solution so much that they decided to do the same with the 458 GT2. That's the reason for the bad looking grille. I also think that the fender look is ruined by the tape that they did put for the very cold temperatures, as James says.